Dental Implants have been used successfully for many years. The implant itself is a post that is surgically placed in the jaw. A prosthesis (artificial tooth or teeth) is then attached to the post. Dental implants involve cooperation between a periodontist and your restorative dentist. The surgical phase of treatment is completed at our office, and the restorative phase is completed at your dentist's office. Dental implants preserve the jawbone, which can prevent prevent the appearance of premature aging. The implant is now ready for a prosthesis. Your restorative dentist will add the prosthesis. 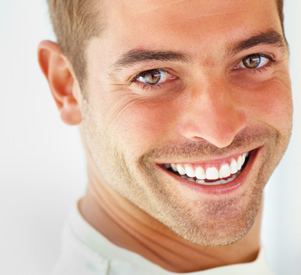 If you are considering a dental implant, Contact Us for an evaluation appointment.Dr. Boretsky will perform an evaluation to determine whether you are a good candidate for a dental implant. If you are a good candidate for an implant,Dr. Boretsky will provide you with further information to help you decide. Dr. Boretsky will perform the implant procedure and your restorative dentist will add the prosthesis. A single tooth implant is the most natural looking way to replace a missing tooth. Approximately 42% of Americans over the age of 65 are missing all of their natural teeth.Dental implants preserve the jawbone, which can prevent premature aging.Dental implants can provide great stability for a lower denture, thereby enhancing chewing ability and helping patients avoid embarrassment.In many cases, dental implants can completely eliminate the need for dentures.